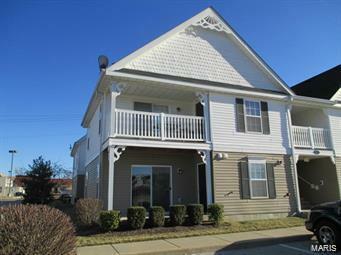 Beautifully maintained 2 Bedroom, 2 Bath Condo! Great location in the complex, second floor corner end unit. The kitchen dÃ©cor offers custom cabinets, breakfast bar. Neutral carpeting and vinyl floor throughout. Six panel doors, vaulted ceiling and open floor plan make this a beautiful home! Enjoy your own private balcony just off the living room. The Master Bedroom has a full bath with double sink, shower and walk in closet and linen closet. A private laundry is located in the unit. Amenities of the complex include in ground pool, tennis court, and basketball court. Great location within walking distance to grocery, shopping & restaurants!